Ford, GM, Toyota and Tesla all plan to expand their offerings of hybrid or electric vehicles. An earlier version of 4 Green Stars story included an incorrect sales number for Toyota's Prius. The number has been corrected. 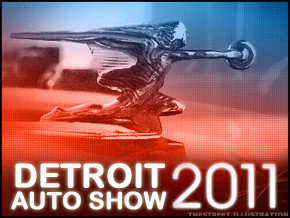 DETROIT ( TheStreet) -- Green cars took center stage at the press preview of the Detroit Auto Show this week. In fact, two of the Big Three U.S. automakers, Ford ( F - Get Report) and Toyota ( TM - Get Report), focused primarily on expanding electric-car families. General Motors ( GM - Get Report) had already rolled out the Volt with a massive publicity effort that included a national tour. At the show, GM CEO Dan Akerson told reporters: "The Volt will help us change how people think about Chevrolet." Meanwhile, Tesla ( TSLA - Get Report) opened the door a little wider on its Model S sedan, showing more of the engineering features in a "body in white" display. Edmunds.com senior editor John O'Dell, who oversees the company's blog, GreenCarAdvisor.com, notes that in Detroit, 11 manufacturers showed plug-in models, of which only three -- the Volt, the Tesla Roadster and the Smart ED -- are actually on sale in limited markets. Here are the four top green cars at the show. Production on the Model S is expected to begin in mid-2012. Tesla already has more than 3,500 reservations from consumers. The price is expected to be about half of the $100,000 buyers have been paying for the Roadster, on sale since 2008. "Suspension, aerodynamics, and the marriage of the battery pack to the body structure distinguish Model S as the superior vehicle of its class," said Peter Rawlinson, Tesla's vice president of engineering, in a prepared statement. "It's not a running car, but it definitely shows that the Model S is not a pipe dream," O'Dell said. Ford made the case that "it's still too early to tell what customers are going to choose" in the green car market, said CFO Louis Booth in an interview. At its presentation, Ford showed 10 compact products, including various versions of the C-Max as well as the new Focus. Chairman Bill Ford noted that the 107 year-old company "once again is doing the same thing my great-grandfather did with the Model T, offering a range of electrified vehicles." Once the company figures out what customers will choose, "we have the flexibility to build up what works best for every region in the world and to ramp up quickly," Ford said. The Chevy Volt might embody all of our country's hopes for a better environment and a domestic automobile industry that can respond to those hopes, but it is important to remember that through Dec. 31, GM had sold just 326 Volts. By contrast, the Prius has sold about two million units, making it the world's best-selling hybrid. Toyota said it will expand the Prius line with the Prius V midsized hybrid-electric vehicle and the Prius C concept car, a non-rechargeable hybrid that will become available in 2012. The Prius V is bigger than its predecessors and is intended to meet the needs of growing families with seating for five while getting 40 miles per gallon, Toyota said. It will go on sale this summer. The Prius C is intended to provide even better fuel economy for "young singles and couples who want an eco-sensitive, high-mileage, fun-to-drive Prius," Toyota said. It will come to market in 2012. The current Prius line features a hybrid system with a self-contained recharging system that does not need to be plugged in. But in 2012, Toyota expects to bring a plug-in Prius to market. On Jan. 10, the night before the auto show press preview began, the Chevrolet Volt was named the North American Car of the Year, selected by a jury of 49 automotive journalists. GM rolled out the Volt during a nationwide tour in the months before the show. As for achieving a more practical sort of success, during the week before the auto show, Enterprise Rent-A-Car said that later this month it will start to make the Volt available for daily rentals at an auto dealership in Ontario, Calif. Enterprise is also installing charging stations at some of its 6,000 U.S. rental locations. "Purchase demand for electric vehicles has been impressive, and we anticipate similar demand from rental customers," said Jeff Morrell, Enterprise vice president, in a prepared statement. GM says the Volt has a driving range of up to 379 miles including 35 miles off its battery and 344 miles from a tank of gas that powers the engine/generator. -- Written by Ted Reed in Detroit.